Learn more about Guatemala and other countries in our daily postcard e-letter. Simply enter your email address below and we'll send you a FREE GUATEMALA REPORT: A Taste of Guatemala. “You live in San Juan del Obispo? That’s my favorite village around here. You’re so lucky to live there.” That’s the typical response I get from both locals and expats in the area when I mention where I live. Colorful painted houses line cobblestone streets sprawling up the steep faldas (skirts) of the extinct Agua volcano. Views look over the former colonial capital of Antigua cradled in the Panchoy valley, and surrounding tree-smothered hills. A few miles away, are the summits of two more volcanoes, Fuego rubbing shoulders with Acatenango. Sleepy San Juan del Obispo is located about three miles above the UNESCO World Heritage Site, popular tourist hub, and expat haven of Antigua in the central highlands of Guatemala, nicknamed “The Land of Eternal Spring.” The pueblo (village) is one of the most picturesque, characterful, and desirable places to live in the area. Cheaper to rent in than Antigua, yet only a few minutes’ drive from the amenities, entertainment, and bustle of the town. For about $450 a month, I rent a pretty two-bedroom, two-bathroom house with a compact leafy walled garden frequented by hummingbirds, and two small rooftop terraces with views of the volcanoes. It also has a garage and three fireplaces for chilly evenings—which we get from December to February. Combined internet, landline, and satellite TV packages start from around $35. Local camionetas, the revamped, garishly painted U.S. school buses used as transport all over Guatemala, run all day between the village and Antigua for about 27 cents each way. The trip takes about 15 minutes to reach the bus terminal next to the overflowing mercado (market). I usually return in a three-wheeled motorized tuk-tuk for about $4.80 or a taxi for $5.45. Famous as the location of one of the first Catholic churches in the country, the first bishop of Guatemala lived in San Juan del Obispo. The impressive-looking Bishop’s Palace adjoining the distinctive church is now a convent and museum open to visitors. The church plaza has the best views of the surrounding area and is a popular meeting point for villagers to hang out during afternoons, weekends, and festivals. Scattered around the village are bakeries and family-run tiendas (stores) selling basic produce. A handful of restaurants offer typical Guatemalan fare including economical lunches starting from around $3.40. Sometimes I’ll relax at one while I eat and read, or order takeout. Craftsmen in home-based workshops make cocoa powder and solid tablets to be melted as drinking chocolate from locally grown cacao. Others make traditional candies or wrought iron and carved wooden ornaments and furniture. San Juan del Obispo is also the main cultivator of the loquat fruit, known here as nispero. There’s even a foot race named after the fruit, created to raise money for their annual Nispero Festival where dozens of artisans display their loquat products, including wine and jam, for sale in the village plaza. A constant flow of festivals, parades, and religious processions throughout the year provides an abundance of local color and an insight into village life. During Holy Week, faithful Catholics create carpets of dyed sawdust, pine needles, and flowers in the path of processions on the topsy-turvy cobblestones. Cowboys ride their horses from all over the area for the annual horse parade, school bands march in the streets, and locals dress up in elaborate costumes to re-enact historic events between horseback conquistadors and Mayans in the village plaza. My life is as tranquil or event-filled as I desire and if I crave more action, Antigua is just down the road. I really do appreciate how lucky I am to live here. Learn more about Guatemala and other countries in our daily postcard e-letter. Simply enter your email address below and we’ll send you a FREE GUATEMALA REPORT: A Taste of Guatemala. 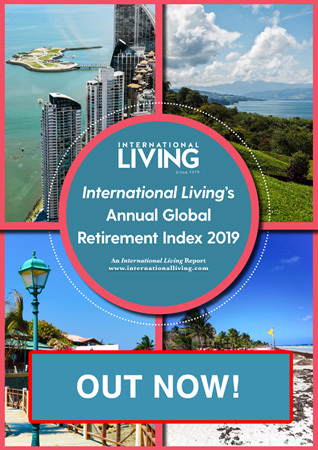 This special guide covers real estate, retirement and more in Guatemala and is yours free when you sign up for our IL postcards below. 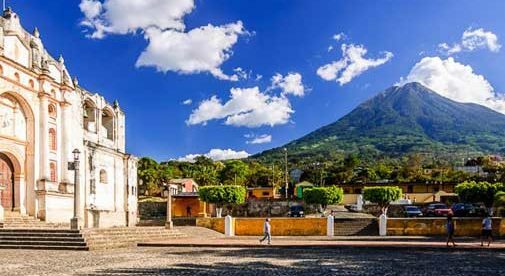 A flourishing expat community has evolved over the years as adventurous spirits from all over the globe set their wandering feet to rest, seduced by the charm and easy living in Antigua, Guatemala.